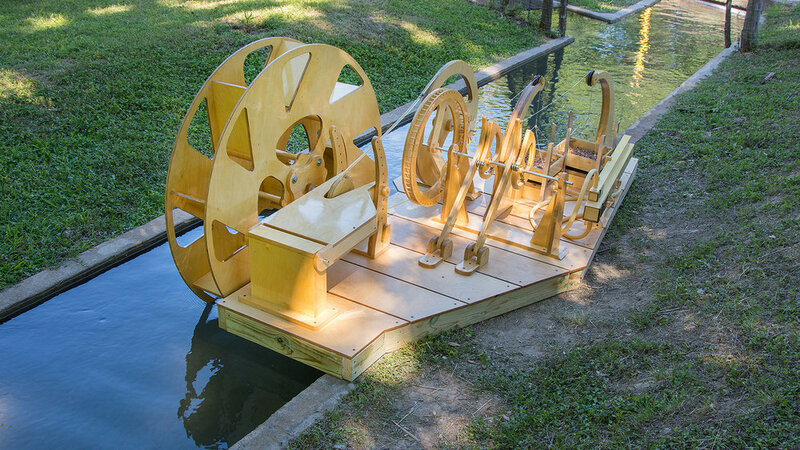 La Llorona is a kinetic sculpture is powered by the waters of the San Felipe Creek which flooded in 1998 with tragic consequences. La Llorona is named after a mythical ghost who haunts the rivers wailing in mourning for her children, whose lives she took in an act of desperation and revenge. This sculpture uses the energy of the water to inflate bellows, like lungs, exhaling every four minutes through organ pipes, emitting a cry for those who lost their lives. It breathes and cries 360 times a day in remembrance. The work was commissioned by Dr. Aurelio Laing, of Del Rio, TX, to honor those affected by the flood.